I’ve read very often, in descriptions of a game’s premise, a phrase which I’ve begun to consider: In a given game, “players take the role of…” A Google search of this phrase naturally turns up almost exclusively hits relating to video games, but it wasn’t until recently that I sat down and really considered the terminology here. The only other possible medium besides gaming to which this might apply is theater, and yet I don’t see a lot of criticism in games journalism drawing parallels between game players and stage players. It strikes me that picking up a controller and picking up a script are, in many respects, quite similar. Most folks who’ve done some theater are familiar with “the actor’s nightmare”: You are in the middle of a performance for which you have forgotten all of your lines and most of your cues, and you are constantly being urged by your castmates to continue despite the fact that you have no script, you have no costume, and indeed you have no pants. I think that playing a video game, or at least any game with a narrative, is a bit like the actor’s nightmare with all of the bite removed: you have assumed a role, you set foot onto a grand stage knowing none of the lines, and yet miraculously, every time you reach the next bit of the story, the words come tumbling from your mouth unbidden. When we say that the player “takes the role of” John Marston, or Commander Shepard, or even Sly Cooper, the implication is that we’re not just using these characters as agents by which to accomplish gameplay objectives–we are actively taking on a role, as an actor takes a role in bringing a play to life. I wish I’d had a health bar when I did theater in high school. The Assassin’s Creed franchise has probably the most direct implementation of this of any game that I can think of. Your health bar effectively measures how in character you are when you’re playing. Because of the narrative conceit that you are Desmond Miles taking on the personae of his ancestors, the game will cause you to fail if you act “out of sync” with these historical assassins. Kill a civilian? 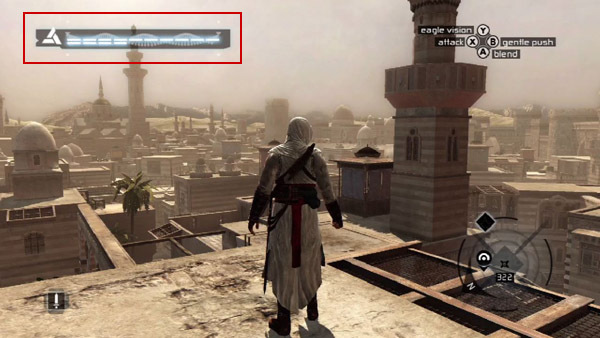 Nope, Altair didn’t do that! Don’t do it again or you’ll be “desynchronized!” Essentially, you get a game over if you are out of character. This is an excellent excuse for giving you a game over if you’re detected on certain missions (“Oops! Ezio wouldn’t have gotten caught there!”) as well as constructing the limits of the game world (“Altair never swam a foot in his life!”). Just because the Assassin’s Creed games are some of the only ones to take this concept and construct their world around it doesn’t mean the principle isn’t at work in other games. 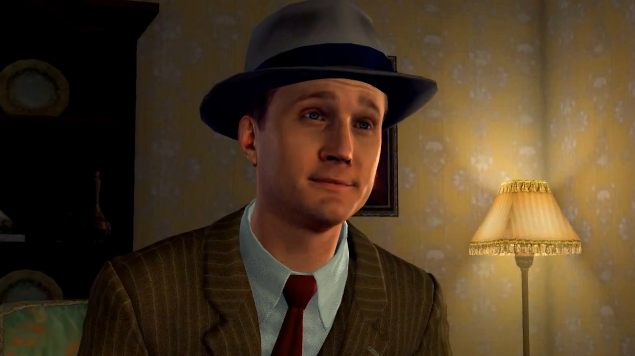 How many of us felt an uncomfortable dissonance playing Cole Phelps in L.A. Noire? Cole’s kind of a jerk! Look at him! He knows it. Nevertheless, I played an awful lot of L.A. Noire “in character.” I was careful with my driving unless we were in the middle of a chase scene, I walked when I could have dashed, I didn’t run people down in the street. Many players like to push the boundaries of the world and test the limits of the play space they’re given. There are plenty of others who don’t–players who don’t like to break the game because it breaks the illusion. I’ve read a lot of arguments considering the matter of cutscenes and their place in gaming, but I think that this one, by Alois Wittwer over at Nightmare Mode, might be among the few I’ve read in defense of them. 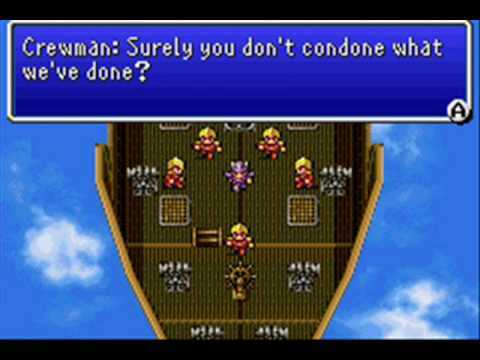 In discussing player agency, Wittwer uses the excellent example of Final Fantasy IV’s opening to show us how a scene over which we have no control can be used to invest us in a world: we’re taking on the role of Cecil Harvey, who does something pretty reprehensible in which we’re immediately complicit, and so his redemption over the course of the story is in some way shared by the player. 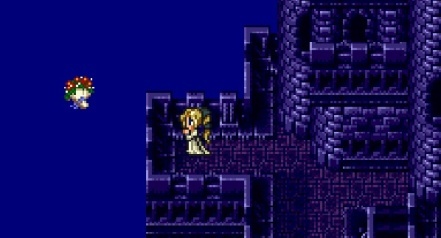 Cecil is a member of a military organization which ransacks a tiny, helpless village to obtain a precious resource (one of the ubiquitous Crystals in the Final Fantasy franchise). The player has very little agency here: a long story sequence, including a handful of battles, plays out before we’re given control of our hero. The argument against cutscenes, the argument for greater player agency, suggests that we can’t feel guilt over Cecil’s actions because we had no choice in them. Like Cole Phelps, Cecil is an agent, not an avatar: he’s not representative of the player–he’s just a role we’re taking on. Cecil’s plight, however, is that he’s not in control of his situation any more than the player is–he’s in service to a king he no longer trusts, committing acts for which he feels remorse. A sympathetic player naturally wants to enable his escape from such a situation (and will feel satisfaction for him when we finally help him to do so). Anyone who has played a part in a theater production at any level will tell you that there is great joy in putting on a play. Taking on the role of character and working with comrades to bring a story to life for an audience is an enormously satisfying endeavor. What a good narrative in a game allows us to do is to participate in this experience on our own, without the aid of others. We take on one role, just as we would onstage, and trust to the game’s designers to carry the rest. Much has been said in games criticism about how the player is simultaneously creator and audience, something which is true in no other medium–but I would add that if any other medium comes close, it’s the theater. Onstage, one can participate in a story which unfolds in real time and which has no “post-production.” The only line drawn between the creators of a stage production and the audience is one which is invisible, hypothetical, mutually agreed upon, and respected by all parties involved (or not!). Playing a game is like having that fourth wall removed, being invited up from the audience to participate, and immediately knowing all of the lines. What a wonder! Is it so surprising, then, that some of us gamers are perfectly willing to abandon our agency if it’s in service of the production as a whole? I think that those of us who consider games critically ought to be more cognizant of the parallel between games and the stage: it strikes me as a more apt comparison than games and cinema. It might behoove game designers, as well, to consider this comparison when thinking about matters of player agency in their design. If we think about the roles that we’re taking on as gamers, we might be inclined to play differently–and the experience might even be improved! On the flip side of the “video games that act like theater” coin, I’ve experienced a few shows that play as games (and I’m not talking about the Pippin production that tied video game escapism into the general lust for an exceptional life). Immersive shows like Sleep No More, where you (the silent protagonist) wander through a dungeon, picking up items and rifling through others’ belongings, all the while chasing writhing creatures as they race through the maze… well, it’s pretty dang close. It’s really hard, though, to sustain this kind of world where performer and audience are all mashed together, especially when you consider audience members who might want to break the rules. Audience-participation theater can be enormously compelling–or very uncomfortable, as the audience is never fully certain of what sorts of freedom they have in collaborating to tell the story. Though it speaks more to the notion of player agency than theatricality in games per se; Bioshock is a lovely meditation on the philosophical issues behind games – that constant tension between being under the retrictions of the game (it’s physics, the storyling, event triggers, etc) and player control and autonomy. It adresses this notion by fooling you into thinking the objectives you follow are merely “necessary suggestions” from NPCs – when in fact you are actively being mind controlled into accomplishing each task. Nearly every game accepts the conceit that the player is fulfilling these objectives because the character WANTS to (I’m a space commando, fighting in space is my job, my health insurance and pension are riding on it!) – wheras Bioshock flatly states that you never had a CHOICE, for all your seeming autonomy as a player. But that’s tangentially related. I’d recommend looking at “Sleep is Death,” a game that feels a lot like an (attempt to be) an improvised theatre simulator in many ways. There are many, many games that play with issues of player agency. One of my favorites is actually Grand Theft Auto IV, which gives the player a choice at the end only to reveal that both choices lead to separate and distinct tragic conclusions– mirroring the game’s theme that Niko Bellic cannot escape the crimes of his past, no matter what values he chooses in the new world. Great argument! ; I am a Theatre HIstory grad student with a life long love of video games. Recently, I have been trying to establish a theory of video games as the next theatrical step rather than film. There have been a lot of developments in the artistic world to incorporate video games such as Eddie Kim’s Machinma theatre (Check out his WOW version of Romeo and Juliet).